Our Couples Massage is the combination of two of our Signature massages. A massage can be a relaxing and enjoyable way to spend an morning, afternoon or perhaps a whole day with your partner. The Attic Day Spa is specifically configured to cater to couples. Our change room is large enough for two people, as is our shower. Here you will change in to our luxury waffle weave microfibre robes. The relaxation room has the two antique foot soaking tubs side by side, so you can soak your feet, while sipping on our range of Rooibios teas. 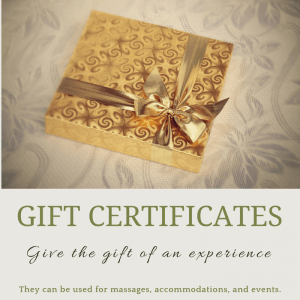 This part of your experience is designed specifically to give you time to unwind and relax, even before your massage begins. Your actual massages are given in separate rooms, because from our experience you will get a quieter experience. People often fall asleep during a massage, and if your partner is a snorer you would not want that! Our licensed professionalmassage therapists will work with you to assure you get the best possible experience. Your massage will last 60 minutes, no chopping off time for disrobing and dressing, that is why we allow so much extra time. After your couples massage you are given twenty minutes or so to leisurely shower (if you so wish) or dress and slowly descend to check out. Or to round off this relaxing experience book a night in one of our Bed and Breakfast’s guest rooms! It really takes the experience to new levels. Our typical Couples Massage consists of a 60 minute Swedish Massage each (Combined cost $198). However you can book whatever sort of massage you would like. We offer the couples massages in both a relaxing 60 minute version, or for total bliss try the 90 minute extended version. 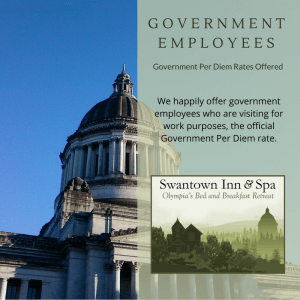 If you are staying the night at the Swantown Inn & Spa, where we are located, you automatically receive a credit on day spa services. Note that you must book the service in advance to be sure of service availability.